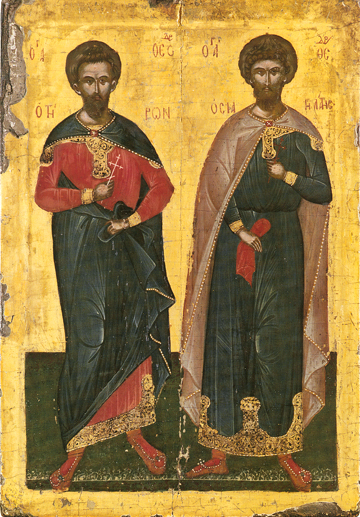 St. Theodore Tyros was a recruit (Tyros) in the Roman army who was brought to trial as a Christian before the Roman authorities in Amasea (in modern day Turkey). He refused to deny Christ, and was given some time to reconsider because of his youth. Inspired by zeal, he then went out and burned down the great Temple of Cybele, the goddess of Anatolia. For this he was burned at the stake as a martyr, and so brought his pure soul before Christ, the True Judge, in the early 4th century. St. Theodore Stratelates was born in Euchaita in Asia Minor in the late 3rd century. Because of his great charity, God opened his eyes to the Christian Faith. After killing a serpent on the city’s outskirts, he was named the military commander, or general (Stratelates), of Heraclea Pontica. While he was there most of the inhabitants turned to Christianity. When the Roman Emperor Licinius (emperor from a.d. 307 to 324) was persecuting Christians, St. Theodore asked him to come to Heraclea with his idols for a great sacrifice. St. Theodore broke all the idols up and gave the metals to the poor, for which he was beheaded in a.d. 319.